Please note: we are NOT the Williamson County Appraisal District (WCAD)! We are a locally-owned, full-service real estate appraisal company that appraises property in Central Texas, including property in Williamson County. We use the Mercury Network to stay compliant with the many regulations of the appraisal industry. Sign up today and add Orlando Masis (Appraisal IQ) to your appraisal panel. Williamson County is in Central Texas, and is home to the city of Round Rock and Dell Computers. The Williamson county seat is Georgetown, Texas. According to the Texas Almanac, Williamson County is also home to over 422,000 residents. If your Williamson County Appraisal District (WCAD) property tax bill gave you a heart attack, please call us at (512) 541-2107 to schedule an appraisal to help you appeal your Williamson County property taxes. A real estate appraisal does not determine the value of your home the same way that the tax assessor’s office does. They use huge databases and mass modeling software to determine values and that means that some always come in too high and some always come in too low. We evaluate properties on an individual basis and can take into account the differences that your property has from other properties that the taxing district might think are similar even if they’re not. If you think your tax assessment is too high, you can protest the value that the tax assessors office gave to your home and try to get your taxes lowered on your property. Who Can Order a Williamson County Appraisal? Anyone can! If you’re not sure what type of appraisal you need for your property in Williamson County, just call us at (512) 541-2107 and explain what you are trying to do so that we can figure out the appraisal product that meets your needs. 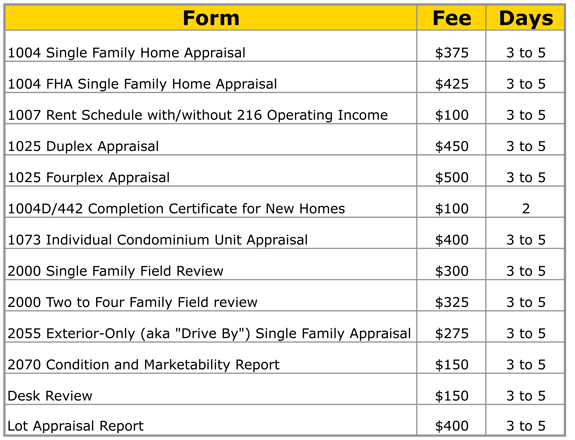 See our list of common Appraisal Types for your reference. Although we prefer to report median values for real estate sales, in this instance it made more sense to report averages. When you have such a large number of sales, the average values are a better indicator of where the market is than when you only have a smaller number of sales where a single really high priced (or low-priced) home can skew the data. You can see this in the difference between the median price and the average price for this year-over-year comparison. A median value is the one where half are higher and half are lower, if you lined them all up from lowest to highest. An average is when you add them all up then divide by the number of items. Average values are more easily skewed by unusual data points than medians are. 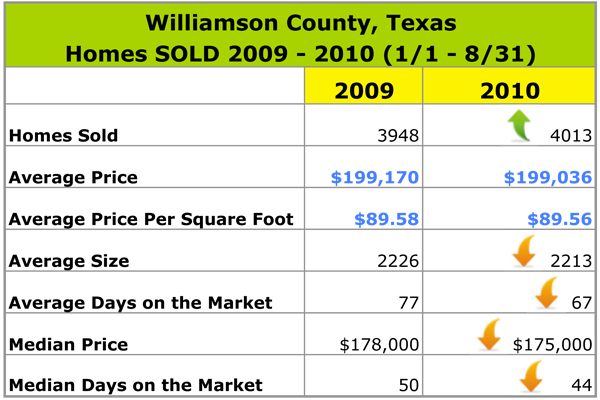 Note the good news – things are holding steady for Williamson County Texas Real Estate. Read our Real Estate Market Area Reports for individual areas and subdivisions in the counties we serve. Our data was obtained from the Austin Area MLS, otherwise known as ACTRIS. We appraise property for the following zip codes in Williamson County: 76527, 76537, 76511, 76577, 76530, 78633, 78642, 78628, 78613, 78641, 78634, 76574, 76578, 76577, 78615, 78664, 78665, 78681. If your zip isn’t on this list, but you live close to, or in Williamson County, we may be able to appraise your property. Please give us a call at (512) 541-2107 to discuss the details. Here is a great zip code map for Williamson County TX.